빌라 카리마에 있는 본 숙소(이과수 리조트)는 본격적인 포스트이과수 여행 시작을 위한 이상적인 장소입니다. 도심에서 단 12.00 Km 거리에 있어 도심의 명소들과 볼거리들을 쉽게 즐길 수 있습니다. Ipora, Handcraft and Tourist Centre, Marco das Tres Fronteiras 등과 같은 다양한 명소에서 투숙객들은 모험을 즐길 수 있습니다. 본 숙소(이과수 리조트)에는 다양한 시설이 있어 포스트이과수에서의 여행 시간을 풍요롭게 해줍니다. 본 숙소에서 24시간 룸서비스, Wi-Fi (무료/전 객실), 장애인용 편의시설, Wi-Fi (공공 장소), 발렛 파킹등을 포함해 다양한 서비스를 이용할 수 있습니다. 본 숙소(이과수 리조트)에는 집같이 편안하고 안락한 총 190개의 객실이 있으며, 감각적으로 세련되게 꾸며진 많은 객실에서 평면 TV, 무선 인터넷, 무선 인터넷(무료), 금연 객실, 에어컨 등을 이용할 수 있습니다. 본 숙소에서 온수 욕조, 피트니스센터, 실외 수영장, 키즈 카페, 키즈풀 등을 즐기며 편하고 완벽한 휴식을 취할 수 있습니다. 이과수 리조트의 전문적인 서비스와 다양한 특색의 매력적인 조합을 발견해 보세요. 조용히 가족과 함께 휴식을 취하기는 좋은 곳이다. 룸과 룸 사이에 방음이 좋은 편이 아니라서 불편함이 있다. 그러나, 바쁜 여행이 아닌 편안히 쉬면서 관광을 하기에는 최적의 장소다. We totally enjoyed the stay. Courteous staff. Great place to stay to see the Falls. Very disappointed that neither Agoda or ourselves had been told the golf course and the spa were being renovated and were not available, the golf course until Oct! This resort is very nice and super close to the airport. It will be even better once the golf course maintenance is completed. The resort grounds are attractive and our room was clean, modern, and spacious. It feels like a brand new resort. Breakfast is great! We ate sushi at the Japanese restaurant on-site one night and it was decent, nothing spectacular though. 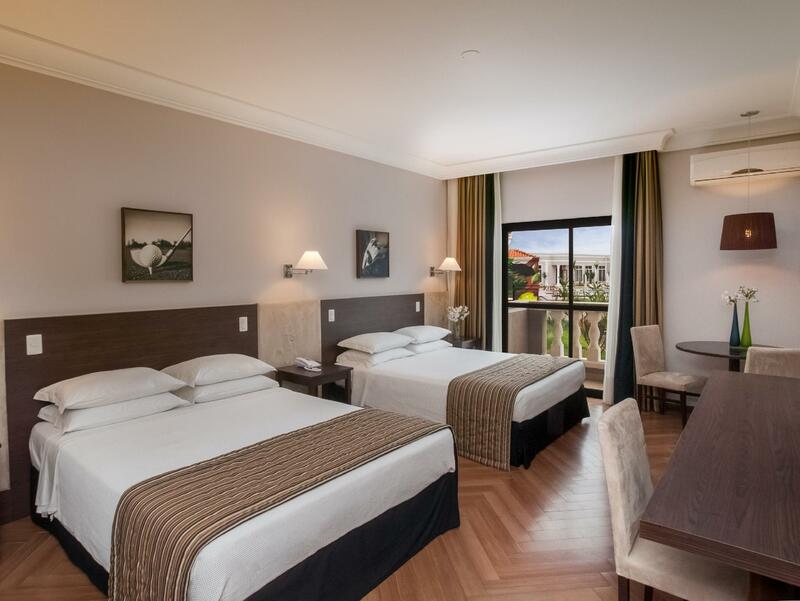 The cost/value benefit was good because it had rooms for four people which is difficult to find in Brazil. Good breakfast, modern comfortable room, good wifi access. The hotel is reasonable for a short stay being near to both the airport and more importantly, the Falls. The hotel being converted into a Golf resort and the course was under construction during our stay. The rooms are in clusters of 10 within each building with around 20 buildings spread around the hotel grounds. We were in the building furthest from the main hotel facilities which meant about a 500m walk to access the facilities, which was a little inconvenient. We did have an issue with our AC not working properly on both nights of our stay and the response by hotel staff was not very prompt so we were left in a sweltering room for longer than was acceptable. We only ate breakfast at the hotel and the choice and quality were very good - we took a taxi into Iguazu to find restaurants and this worked out well. This is an OK hotel for a short visit to the Falls but I would have preferred a hotel where the rooms are within the same building as all of the facilities. The gardens, food (although not open late), nice new rooms! It was very nice, friendly staff and beautiful resort overall. 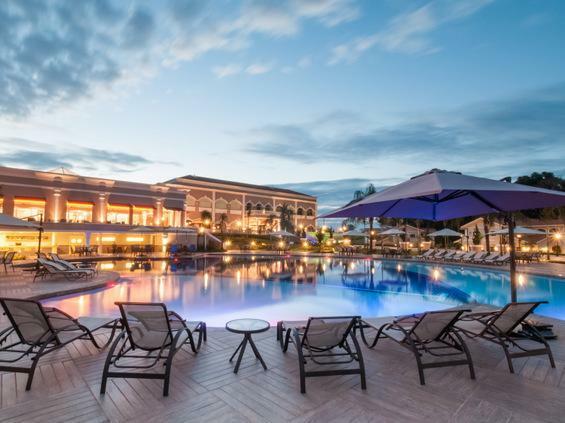 We've really enjoyed our stay at Iguassu Resort! Location of this hotel is great: 10 minutes to the National part and 15 minutes from the airport. It is a 4 star hotel, however we felt it was almost 5 stars. The facilities were fantastic and it was totally worthwhile the money we've spent! Territory of the hotel was very green and relaxing. Für familienurlaube bzw. wer das Golfen sucht, liegt dieses Hotel genau richtig. Die Zimmer sind sauber und der Service ist gut. Allerdings unser Urlaub beschränkte sich auf Sightseeing in der Umgebung. Für solche Aufenthalte lag diese Hotel sehr abseits und ohne Taxi unmöglich einen öffentliche Haltestelle zu erreichen. Auch einen Hoteleigenen Shuttle gab es nur gegen Bezahlung. equipe muito solicita, terreno. plano, tranquilidade. Como viajamos com uma portadora de necessidades especiais sentimos falta de algumas adaptaçoes, embora o resort tenha rampa de acesso em varios lugaares, nas piscinas e hidro, não tem barras de apoio. De resto tudo é maravilhoso. 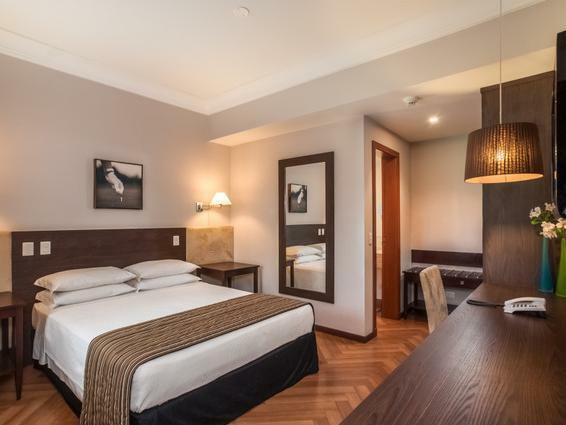 Bons apartamentos, espaço harmonioso e envolvente, equipamentos da academia, simpatia. Sem duvida um Resort a ter em conta, tem porém um longo trabalho a ser concretizado, construções por acabar com consequente barulho das obras em curso, pessoal esforçado mas com muitas deficiências organizacionais, piscinas muito mal limpas, serviço do restaurante desadequado, café da manhã razoável. Concluo com optimismo já que fiquei com a sensação que as chefias estão muito envolvidas e empenhadas na "afinação da máquina".